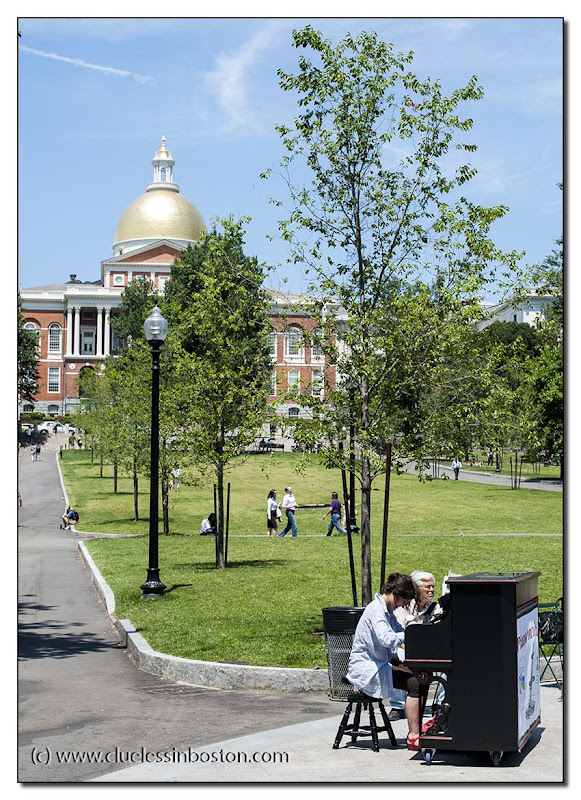 Lunchtime music on the Common, with the State House in the background. Piano is usually an indoor instrument; I feel it must be great to be playing piano outside, especially in such a beautiful place! Nice to see. We need more of this in my area. awesome idea, a piano at the street and your picture is fabulous! This is strange one. Perfect spot too. That gold dome is reminding me of the Georgia state capitol in Atlanta. What a nice day for an outdoor concert! I just love it when you come across scenes like this, well captured! Lovely photo! We have a roaming outdoor piano in London. Is that one roaming? I saw it the other morning near work but it was still under a canvas at that time. Really? You don't see that every day. The woman playing the piano could actually be my twin....or perhaps I was having a Twilight Zone experience and wasn't aware of it.